What follows is the most abjectly stupid online marketing I’ve come across. From a company that really should know better. I found a legal website proactively advertising the services of a direct and hated competitor. Advertising simply does NOT belong on the website of any service provider. You don’t want someone considering hiring you for their car accident to get distracted by a display ad for Nikes, the new Toyota Camry, a WonderBra . . . or worse . . . your competitor (more on that later.) It seems pretty obvious . . . your site is there to sell your services and not generate some residual revenue as a publisher of display advertising. 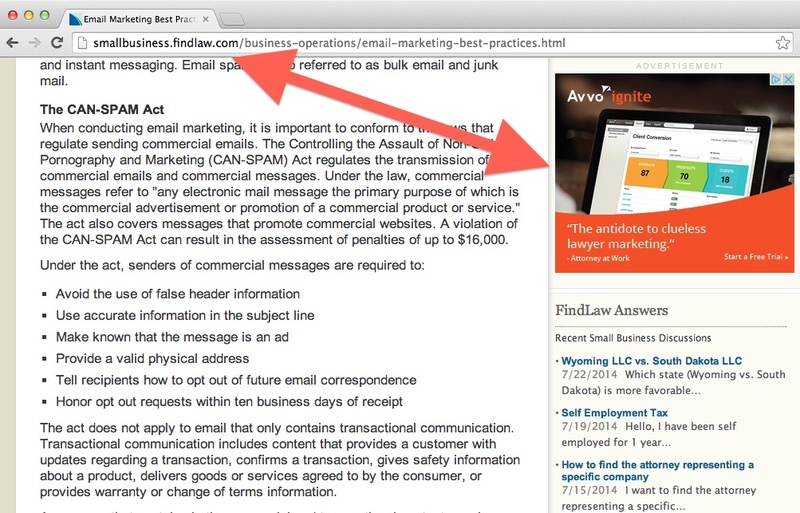 Over the years, I’ve collected examples of law firm websites that contain third party display advertising . . . usually they are old, outdated or abandoned sites (frequently blogs). But sometimes they are a firm’s primary current site, hoping to generate a little extra income as a Google AdSense publisher. I’ve filed away a collection of screenshots with the intention of eventually writing this post; but just today I ran across something so spectacular that I dropped everything to write. I know this is a mean-spirited post and generally I’m not so flagrantly cruel, but are you serious? Now clearly, this is a remarketing campaign from Avvo and not a direct display ad buy. But, at the very least, it is mindnumbingly easy to exclude competitors’ advertisements on your own website with even the most rudimentary ad vendor. But really – this isn’t about appropriately configuring a website – its about recognizing that the primary objective of your site is to get people to engage with the services you provide – and ads on your site detract from that objective. So if this is in any way unclear: If you sell a service, third party advertisements do NOT belong on your website. Doing so enables your competitors to directly target your audience. As for FindLaw . . . think very carefully before placing your marketing investment in the hands of a company so spectacularly inept that they display competitor’s advertisements on their own website. Clueless lawyer marketing indeed. I just came across the same thing on a Financial Advisor site – it’s not limited to Lawyers. We must hold ourselves to a higher (even if its not that high) standard! I have actually bought directly on Findlaw.com using Google’s Advertising Network instead of buying display advertisements via Findlaw’s rep… guess what. It is considerably cheaper, and doesn’t involve a contract. Mind you, this was back in 2010 so you may not be able to game Findlaw’s directory pages like that anymore.